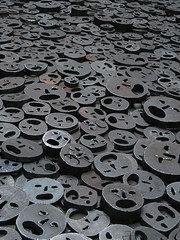 To this day, the populations of the former Soviet Bloc, and some elements of their intelligentsia, have yet to come to terms with their historical complicity in the Holocaust, painting their ancestors as victims, which indeed many of them no doubt were, while ignoring the fact that many were erstwhile collaborators. In Lithuania, for instance, where over 95 percent of the country’s Jewish population died in the Holocaust with widespread Lithuanian complicity, the government has actually attempted to bring legal charges against Holocaust survivors who participated in the anti-Nazi underground because they happened to collaborate with communists. The diaspora has ben a wonderful thing for Jews in many ways, in that it has given us footholds throughout the world. But it has also taught us that there are lands where it is possible we really do not belong. Indeed, if anything affirms my belief in the importance of both Israel and a diverse diaspora, it is matters like these. Clearly, the welcome mat in former centers of Torah learning like Vilna have, for Jews, been rolled up and burned.